After an introduction we’ll venture out for a short walk (approx. 1hr) looking at wildflower seed heads and discussing the different methods of collection. Followed by refreshments and an indoor training session on propagation, covering sowing methods and mediums, pots and germination of the different wildflower meadow species. Includes a 'take home' seed propagation kit and information pack. No dogs allowed. Celebrate National Meadows Day at Bell Sykes Coronation Meadows. 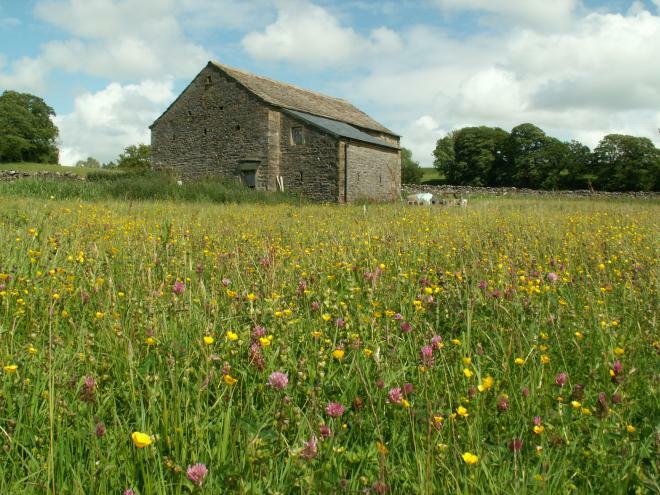 Join us for a chance to see the fabulous hay meadows at Bell Sykes Farm in Slaidburn. Blackwell family for the past three generations. This is a great chance to learn more about the plants and wildlife which inhabit the meadows, take a guided flower or bug walk, watch rural craft demonstrations, learn about the traditional used of meadow plants, see a meadow cut by hand, or just sit and enjoy tea and cake. Guided walks at 11am and 2pm (£3). Teas available at additional cost. With thanks to the Slaidbutrn Estate. In May of 2012, the Forest of Bowland AONB joined forces with the Yorkshire Dales Millennium Trust (YDMT) to deliver a Hay Time hay meadow restoration project here in Bowland, funded with help from the Lancashire Environment Fund. Working together with farmers in the AONB, each year the project harvests wildflower seed and 'green hay' from species-rich meadows and uses this to restore meadows which have lost some of their characteristic plants. The project also aims to increase public awareness, enjoyment and understanding of the hay meadows found in the area, improve public access to meadows, and survey meadows to record the variety and number of plant species they contain. Between 2012 and 2018 the project has improved the quality of 65 meadow sites, covering over 300 acres of grassland in the AONB. Hay Time has also lead to the delivery of other related projects - Networks 4 Nectar worked on improving small patches for visiting wild pollinators as well as field scale meadow restoration and Wildflowers 4 the Meadows trained community groups to grow their own meadow plug plants to enhance sites they look after, as well as continuing with the meadow restoration work. In 2018 Hay Time Rescue began, and Carol Edmondson joined Sarah in the AONB team. Over the coming months this project will re-establish scarcer plant species back into places where they have been lost, as well as continuing the field scale meadow restoration work. In 2012, Sarah Robinson, the Bowland Hay Time Project Officer said, "Bowland Hay Time is an important and exciting project and I am delighted to be part of it. 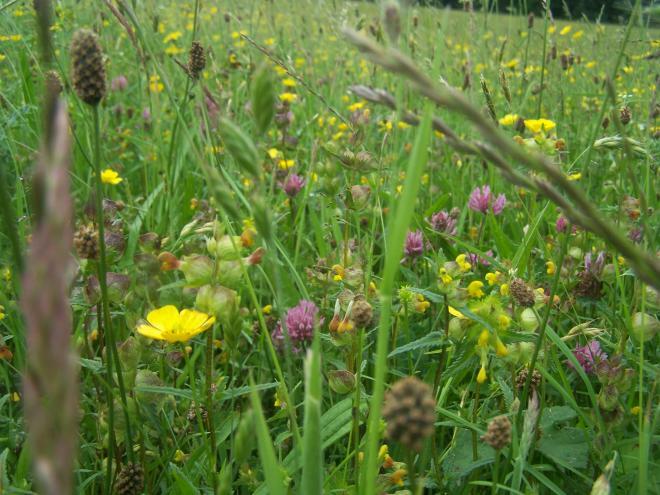 I’m looking forward to working closely with hay meadow farmers in the AONB who are interested in getting involved with the project, either through having seed harvested from their meadows or through having their meadows enhanced through seed addition." Hay meadows are one of our rarest habitats and a priority for conservation and enhancement in the UK Biodiversity Action Plan. Largely lost from the rest of the country, these meadows survive thanks to traditional farming practices, in particular the late cutting of the crop in July or August. 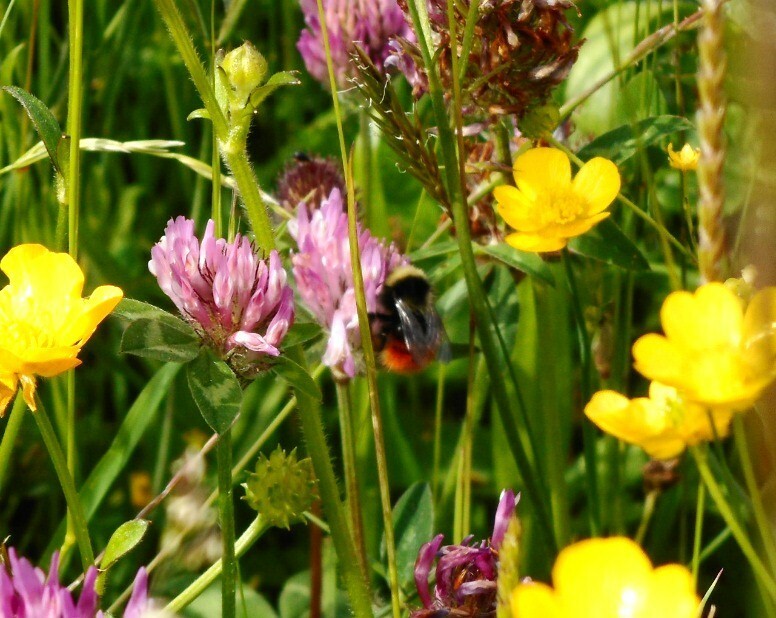 During spring and summer the array of colourful flowers and grasses in hay meadows make not only a wonderful sight but create important places for other species such as bats and birds to feed and nest in. The AONB contains a significant number of the UK’s remaining upland hay meadows and as such it is an important area for this stunning habitat. Hay Time Rescue is now well underway, with the first of our volunteer growers reporting globe flower seed germination. The Millennium Seed Bank at Kew Gardens in Wakehurst is also propagating some Forest of Bowland seed for us, and after spending the winter 'stratifying' in refrigeration (some species's seeds need a period of cold to replicate the winter temperatures in order to germinate) they are now sown out and under close watch (see photo 1). Beewalk Report 2018 is now available to download here. The project yet again demonstrates the success of the hay meadow restoration work in providing habitat for foraging bumblebees, including some of the scarcer species. Over the 16 sites surveyed a total of 2436 bumblebees were recorded by 21 volunteers, and included 11 different bumblebee species. The most abundant species recorded were the white-tailed bumblebee and the buff-tailed bumblebee. Small numbers of heath and bilberry bumble bees, both scarce nationally, were recorded at some sites (see photo 2). The most commonly visited flowers were yellow rattle, common knapweed, white and red clover, thistles and meadowsweet. Other highly ranked species were eyebright and meadow vetchling. There is an overall increase in numbers year on year since the monitoring began in 2016. Beewalk 2019 We are now recruiting volunteers for this year's bumblebee monitoring project, so if you would like to get involved and have a few hours a week to spare over June and July then please get in touch for further details. We provide some training, your travel expenses and the bumblebee recording pack – all you need is a sunny day and a pencil! Please contact Carol on 01200 448000 or Carol.Edmondson@lancashire.gov.uk for further details. 2018 saw the start of the Hay Time Rescue project, and Carol Edmondson joining the team to run the project. Carol is working with local enthusiasts and farmers to grow on and plant out grassland species now scarce across the AONB, including melancholy thistle, globeflower and sawwort. Field scale restoration work continued across the AONB, with more sites added to the tally. Our totals now stand at of 65 meadow restoration sites, covering over 300 acres of grassland in the AONB. As well as the field scale meadow restoration, the project has a close and effective relationship with Edgehill University in Ormskirk. Since Elizabeth Sullivan started to study the Bowland SSSI meadows for her PhD in 2012, we have also hosted a student placement, assisted in MSc field trips to Bell Sykes and helped to organise MSc research for four students. This year was no exception, with two students studying the restored meadows and their donor sites - one project on plants and another on spiders hunting amongst the top of the hay crop. These are great collaborations, as their academic research continues to show the effectiveness of meadow restoration for biodiveristy as a whole. In 2016 Carol Edmondson was our placement student, and that summer Carol went on to undertake her MSc research on the importance of restored meadows to foraging bumblebees, by helping to support the YDMT and AONB volunteers working on the Bumblebee Conservation Trust 'Beewalk' monitoring programme. We are very proud of the work Carol has done, not least because her reseach was published in 2017 - you can see a copy of it here. Carol's research showed that in the restored meadows, bumblebee numbers are as high as in the donor meadows from just one year after the restoration work has been done. 2017 has been a year of celebration, as it marked the 20th anniversary of our fabulous Hay Time project partners, the Yorkshire Dales Millenium Trust (YDMT), who have helped to ensure that the Hay Time project has continued to run since May 2012. As part of the celebrations, the Trust decided to award 20 charity awards to exceptional groups, organisations and individuals who achieve great things for the Yorkshire Dales and surrounding areas (like the Forest of Bowland!). You can find out about all the winners here, including three winners from the Forest of Bowland! Peter and Linda Blackwell from Bell Sykes Farm one the Gold award in the Conservation, Heritage and Environment category; our Hay Time contractors Marsden AES picked up the Bronze in the same category and Erica Sarney, who works with us in delivering pollinator patches in the Lune Valley through Networks 4 Nectar and WIldflowers 4 the Meadows won a YDMT Champion Award. Well done to them all! 2017 was also a pretty wet summer, but we did manage quite a bit of meadow restoration work, including moving green hay onto three of the SSSI meadows in the Tarnbrook valley. In total we worked on about half of the sites we had intended to, and undertook restoration work on a total of 7 meadows on 4 farms. We did have a good day for National Meadow Day at Bell Sykes though, with over 100 people coming to enjoy the meadows and the crafts, the guided walks and the tea and cake! 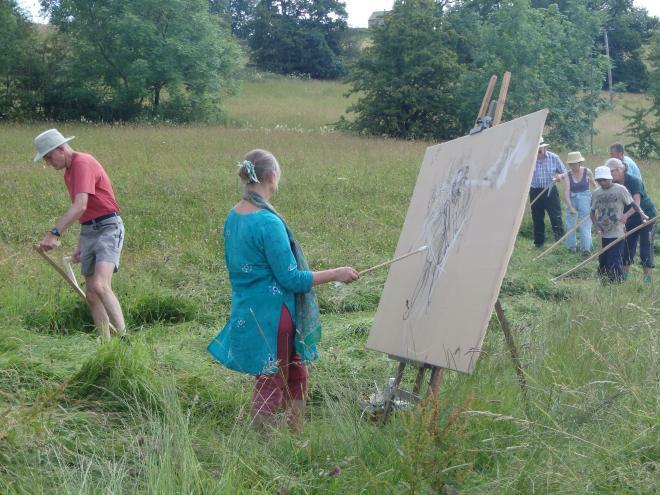 This is a national annual event which we organise with the help of Peter, Linda and all of the Blackwell family and its held on the first Saturday of July every year. I began the season this year planting out many hundreds of plug plants into the meadows we are restoring under the Coronation Meadows project. This picture shows us planting out in the spring sunshine - there were alot of rainy days as well! We restored 8 meadows on 6 farms covering just over 10 hectares of land this summer, as usual battling the wet weather a bit, but we managed it all in the end! Bell Sykes was our main donor site again, so many thanks go to Peter and Linda Blackwell for their continued help and support with the project. 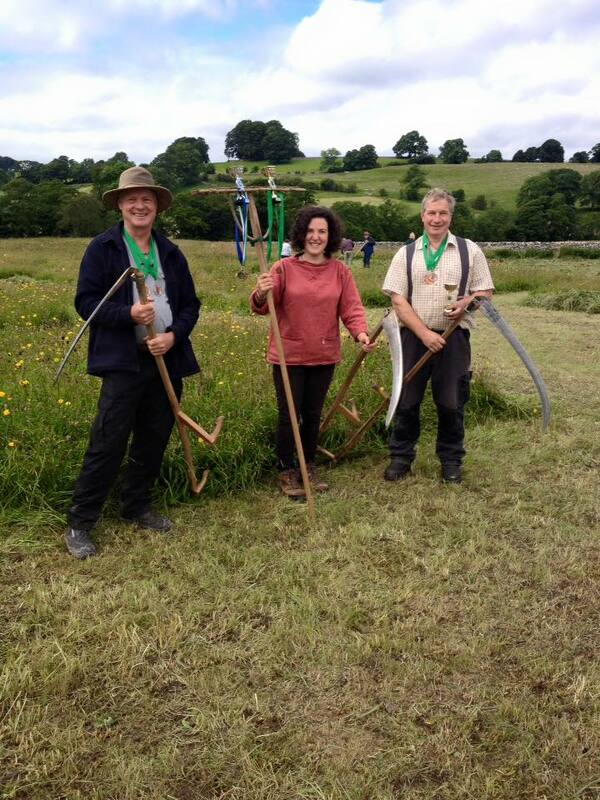 Peter hosted the Northern Scything Championships at Bell Sykes in mid July, here are the winning mowers from left to right: William, Ruth and Peter. We completed six green hay schemes this summer, helping to restore 12 more meadows in the Forest of Bowland covering 21 ha, including one SSSI in Bolton by Bowland which was failing its condition assessment. It's great to know that Natural England have confidence in our methods to help to restore this important site. The final scheme was not completed until the first week in October, it has been a bit of an unsettled summer weather wise! We have taken delivery of 2800 plug plants which are being grown for us by the Offshoots permaculture project in Burnley, with funding from the Coronation Meadows project. Our funding from CM has increased during the summer, with an increase in the number of plug plants they want us to plant and the addition of two further green hay transfer schemes scheduled for next summer, covering a total of 10 ha. Most of the plug plants have been planted out now, the rest will go in after the winter. I began the summer season by visiting and monitoring all of the meadows which we have worked on since 2012, and was joined by ecologists from Bowland Ecology Ltd who helped on some of the surveys. . Whilst not up to the rigours of an academic research project, the data once collected and analysed, has helped to direct us in the 'what happens next?' discussions for Hay Time. Whilst it is imperative that we continue with the green hay restoration work, it is clear that there are several key species which are often not transferred by this process. These are the later flowering and less seed reliant perennials such as wood crane's bill, knapweed, melancholy thistle, yarrow and others. We are working with Kew to help in the production of plug plants for these species, a relationship which we hope to foster further next year, if we are successful in our current bid to the Lancashire Environmental Fund to continue the Hay Time work through meadow enhancement. We will find out just before Christmas. Following on from the fantastic course I attended at Kew in July looking at seed collection, drying and storage techniques, meadow restoration techniques and the workings of the Millennium Seed Bank, I am running a cascade training session to look at setting up small project scale seedbanks on Tuesday 15th September. Coronation Meadows immediately bought half of the places for their meadow managers, and the rest were filled in a week, we already have a waiting list to run the course again next year. 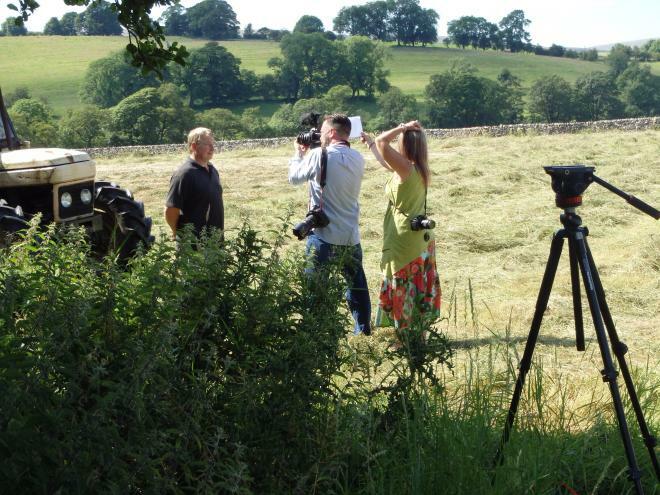 During some of the hottest weather this summer, we were invited by out Hay Time funders, the Lancashire Environmental Fund, to take part of some filming as part of their 2014 Annual Report. Our Hay Time and N4N funders film is now on YouTube, we are at 8.22 – 10.10 mins! The film is shot at Bell Sykes SSSI in Slaidburn, which is also designated at Lancashire’s Coronation Meadows site. This summer has been a bit different to the previous two, due to changes in funding streams and the first summer of the Networks for Nectar project, which is focussing on small non-farmed sites compared to the Hay Time scheme, which focuses of field scale restoration work. This summer there have been four field scale restoration schemes, one funded via HLS, and three funded by Biffa Award, as part of the UK wide Coronation Meadows project. These three schemes have been completed using seed from Bell Sykes farm, Lancashire's Coronation Meadow site, harvested using a brush harvester which we have borrowed from Nidderdale AONB. The rest of the restoration schemes, thirteen in total, have been under the Networks for Nectar (N4N) project, where we have been supplying seed and providing management advice to private owners and local businesses wanting to produce nectar sites and small meadows for invertebrates. There have been a whole variety events, including: a bioblitz for Hurst Green St John's Eco-congregation; a meadow walk for the Lancaster Bee Keepers at Bell Sykes; a day long meadow event in Slaidburn as part of Festival Bowland; a picnic with meadow activities at the restored meadow in Gisburn Forest; an open day at the Bell Sykes Coronation Meadows a two day mowing course also held at Bell Sykes with Steve Tomlin the scythe tutor and a local artist capturing the scything in pastels; a field trip to the Rathmell meadows as part of the national AONB Conference; advice to Bolton-by-Bowland parish council on their parish plan; support for our Edge Hill PhD student looking at SSSI meadows in Bowland; support to our Edge Hill MSc student who is looking at spider diversity in restored meadows in Bowland; scything partys at Melling Village Green and Hurst Green St John's churchyard; filming for Lancashire Environmental Fund, one our main funders, as part of their Annual Report and most recently hosting a visit from Biffa Awards to see how their money has been used. In addition to supporting the two students from Edge Hill in their individual work, we also hosted the MSc course for a day's field trip during which they collected vegetation data for the site. In July we hosted a week's placement for a UCLAN MSc student studying environmental management who is also registered blind. He interviewed local farmers for his project, helped with seed collection and propagation and also attended the scythe training course. Work has also been ongoing revisiting the restoration schemes completed in 2012 and 2013, as well as visiting potential sites for next year, in partnership with the local HLS team, who now look to the project to provide recommendations on site suitability for restoration. This has already resulted in a list of seven farms with field scale restoration forming part of their HLS agreements. 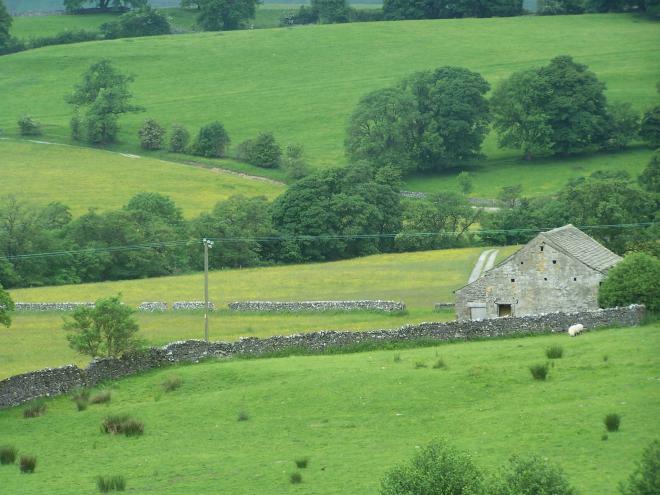 Currently I am organising a week's field trip for a group of 11 practitioners from Latvia, Estonia and Lithuania, who are part of the EU funded LIFE Viva Grass project, and will be visiting Bowland, the Dales (with Tanya's help) and Cumbria. Next on my list is to complete work on the GIS layers and local sites records which has been a little neglected of late. Video footage of hay making at Melling during September - see some scything and raking by hand! One of the highlights from May this year was a call from Plantlife asking for my assistance in nominating the Coronation Meadow for Lancashire. In conjunction with the Lancashire Wildlife Trust, who were coordinating the nominations, Bell Sykes Meadows were accepted. As I'm sure you all know, the Coronation Meadows project, initiated by HRH Prince Charles, has listed 60 meadow sites to become donors for further restoration work. The sites need to be species rich, open to the public and the owners need to be willing to take part in restoration schemes. Bell Sykes fits the bill perfectly, with 4 SSSI meadows and 1 BHS meadow covering a total of 12 hectares, a network of footpaths across the farms, a downloadable meadow walk which we have developed as part of the Hay Time Project, as well as 6 hectares of meadows where we spread green hay last August – this is now stuffed with yellow rattle and eyebright. Peter Blackwell, from Bell Sykes Farm went down to Highgrove for the launch of the Coronation Meadows, his impressions of the day were that the meadows at Highgrove were 'not a patch' on his, and that the weather was far too hot, compared to Slaidburn. Work continues on the restoration list for this summer, I am now in the process of marking out where the donor hay will be taken from, having matched donor sites to where the green hay will be spread. Fiona has arrived and is getting on with surveying potential restoration and donor sites, BHS sites, as well as any other sites which partners would like to know more about. In mid June I joined the rest of the team to do a very enjoyable two day stint at the NEC Gardeners World exhibition. It was great talking with so many interested people, the YDMT garden was hugely popular, and was buzzing with bees whenever the sun came out. The Festival Bowland meadow events are now in full swing, so far there has been a grass and sedge ID day, a walk through the Coronation Meadows at Bell Sykes, a digital photography workshop also at Bell Sykes and a family Hay Day at Lower Gazegill organic farm near Gisburn, where we lead meadow walks and then had lots of craft activities available in their excellent educational access classroom. We also launched a new Access for All tramper trail in a circular route taking in their species rich meadows. 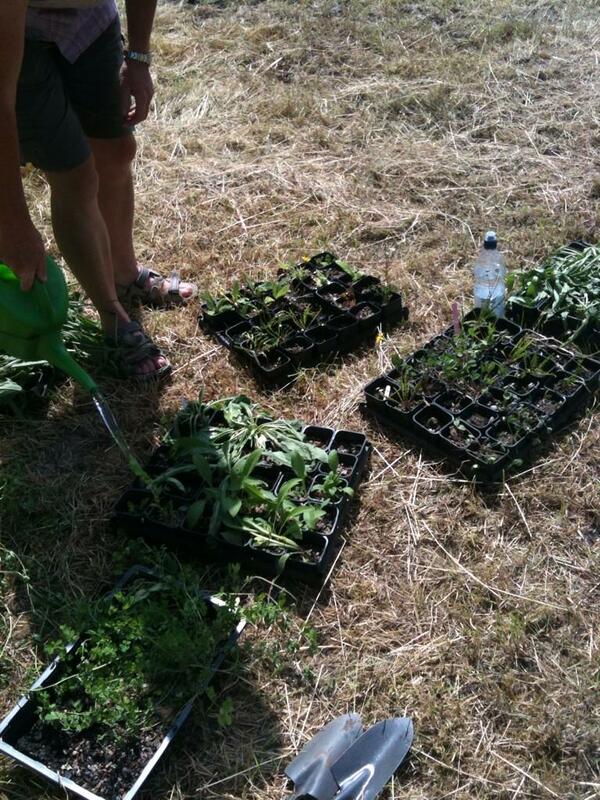 At the end of June Don helped me to run a national CPD day on meadow restoration for Flora Locale. We had 7 participants from around the country, all working on different grassland restoration projects, all eager to see the practicalities of the project. Steve Marsden brought his harvesting and spreading equipment over, and we had an excellent and sunny day. July and August will be filled with undertaking our planned restoration schemes, helping Judy with the Bowland Outreach project pilot, taking part on more Festival Bowland projects, finalising the seed propagation leaflet and hoping for sunny weather. In 2012, Plantlife published Our Vanishing Flora, a report highlighting the loss of wild flowers from individual counties across Great Britain since the Coronation. In his foreword for the report, Plantlife's Patron, HRH The Prince of Wales called for the creation of new wild flower meadows, at least one in every county, to celebrate the 60th anniversary of the Coronation. The Coronation Meadows Project, led by Plantlife and in partnership with the Wildlife Trusts and the Rare Breeds Survival Trust, is working to achieve this goal. This exciting project has two distinct aims. The first is to identify one flagship wild flower meadow – a Coronation Meadow - in each county. These meadows will be celebrated as the surviving “jewels in the crown”, places where people can enjoy a riot of colour and an abundance of wildlife in settings that have remained largely unchanged since the Coronation. The second aim is to use these Coronation Meadows as source or ‘donor’ meadows to provide seed for the creation of new meadows at ‘recipient’ sites in the same county. In this way, new Coronation Meadows will be created, increasing the area of this valuable habitat, providing new homes for bees, butterflies and other pollinators and helping to secure our wild flower heritage for the next 60 years and beyond. Bell Sykes Meadows includes six unimproved flower-rich fields. Three of these are alongside the neighbouring River Hodder and include grasses such as meadow foxtail and sweet vernal grass along with moisture loving flowers like great burnet and meadowsweet. The upper three fields are home to the characteristic flowers of dry hay meadows in northern England. Meadow crane’s-bill and melancholy thistle grow together with a colourful mix of yellow rattle, eyebrights, pignut, buttercups and lady’s mantle. There are also three new meadows on the farm, which received hay from the species-rich ones in August 2012 as part of the Bowland Hay Time project. They already have yellow rattle and eyebright growing in them since the hay was spread. Bell Sykes Meadows is one of the last unimproved flower-rich grasslands in this part of Lancashire. This vulnerable habitat has become increasingly scarce and has largely been destroyed in Lancashire through agricultural intensification. On the 23rd April, we had a visit from MSc students from Edge Hill University, who visited as part of their Habitat Restoration course. Their tutor, Elizabeth Sullivan, is currently completing her doctorate looking at the changes in Bowland meadows SSSI sites since the early 1980's. During their visit we went to two of last year's restoration sites at Slaidburn and Gisburn, and were delighted to find germinating yellow rattle seedlings – fabulous to see after such a cold start to the year, and a great boost for the project! Elizabeth is returning shortly to run through the next stage of her research, in which she will be looking at the genetic diversity of meadows and grasslands around the SSSI clusters, and will be using our data to help her. 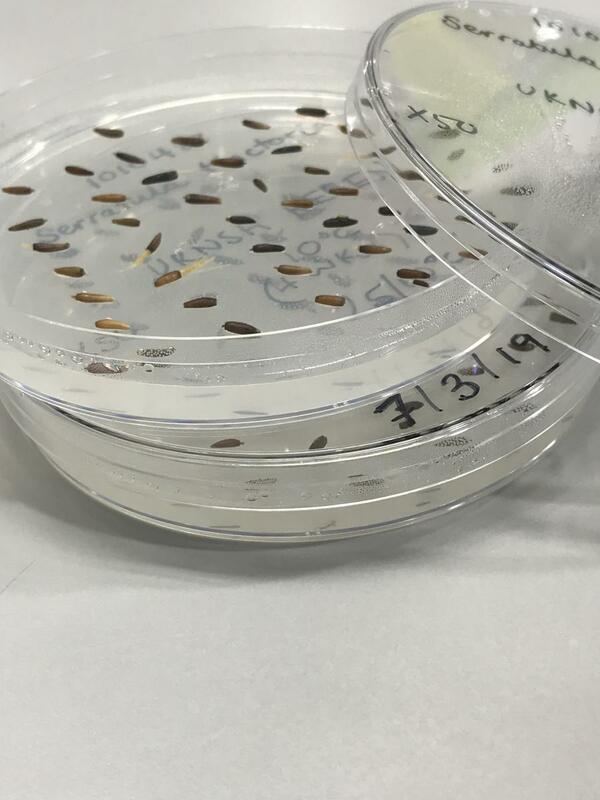 We will hopefully see how the meadow sites inter-connect at a genetic level, which will give us further insight into how far it is prudent to move seed from one site to another. Green shoots have also arrived in the seed nursery, the next job is to work out how to keep all the trays safe from the lambs which visit the office here at Dunsop Bridge. I have been working on the list of priority sites which Fiona will survey this summer, and the first tranche of introductory letters will be in the post today. Fiona will be here from June, so doing this preparatory work now helps to make best use of her time, and means that she has an easier task in booking her survey visits with farmers. There are around another 50 sites just on the Biological Heritage Sites list, as well as sites put forward by Natural England and, the County Councils other partners. I have also been working on the restoration plan for the summer, already there is about 3 season's work on the list, which will be added to by the results of Fiona's work. The extension to my contract will enable us to work on finding further funding for the project, as the need and scope for further work can easily be demonstrated. My next task is to visit all the remaining sites from last year to see how germination and establishment is progressing, and then in June establish which of the sites on the restoration plan we will plan to tackle this summer. 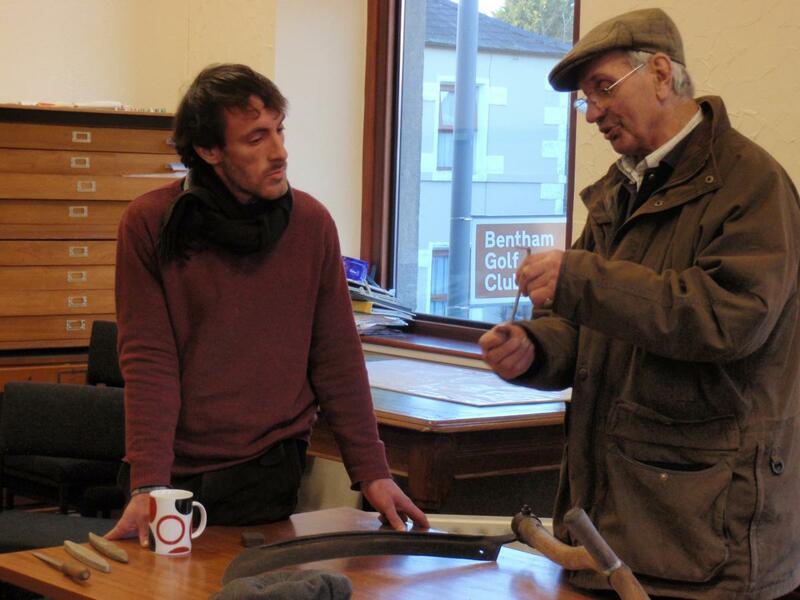 O n Wednesday 6 February, we organised a winter scythe maintenance workshop at Bentham Mart, during the fat lamb sale, when scything expert Tom Brandon demonstrated scythe maintenance, peening and sharpening. Members of the team were available to talk with interested farmers, copy hay time photographs and collect hay time stories. We talked with with several farmers about Hay Time in the past, and as part of the event, had a set of four publicity boards produced for the project, which will be useful for the other events coming up. On Monday 11 February I gave a presentation about the project to the Craven Conservation Group in Settle, followed by a lively discussion about restoration techniques more generally. There was a lot of interest in the project, and contact with this group may help to recruit more volunteers to monitor meadows, especially in the Craven part of the AONB. As well as the public events organised as part of the project within the Bowland Festival, Don and I are working together to organise a Meadow Restoration workshop for Flora Locale, a national organisation providing training and CPD for environmental professionals. The day in June will have a morning session inside, followed by an afternoon looking at a site with SSSI meadows as well as three meadows which has restoration management through the project last summer. We are also discussing whether to have a Hay Time demonstration event within any of the summer shows this year. I am continuing to visit the Slaidburn Archive to read an amazing set of farm diaries kept by one family from 1943 onwards. Following on from the war years and the advent of bag fertilisers in the 1950's, the diaries from the 1960's describe the family buying their first baler, Land Rover, and their participation in War Ag schemes to drain and apply lime and slag to the meadows. At the Archive I have also met with several local people who are keen to have their recollections of hay time recorded. The plug plant nursery is now all planted, thanks to Holly, our biology undergraduate student placement, we await spring shoots! Holly has also been busy completing the work of sending species lists and letters out to the 54 sites visited by Fiona last summer. The results of Fiona's work on Biological Heritage Sites showed that many, around 50%, had lost value in the 15 years since their last survey, and as a result some, around 10%, will now be deleted from the register. However, and much more encouragingly, her surveys found 5 previously unknown meadows on three farms which are have now been added to the register. We will now be looking at compiling a list of sites for Fiona to survey in summer 2013, as well as starting to visit the potential sites for restoration and approaching potential donors to see if they would like to take part in the project this summer. The Hay Time project in Bowland has been concentrating time on planning for 2013 over the last few weeks. A long list of potential restoration and enhancement sites has been completed, so far with almost sixty hectares of meadows identified as potentials for the coming summer. More are being added every week, as work with the local Natural England advisers continues. Interestingly there are also a significant number of sites which, in the main due to their small size, are not covered by HLS agreements, and so will need to be covered by project funding if they are to be restored. 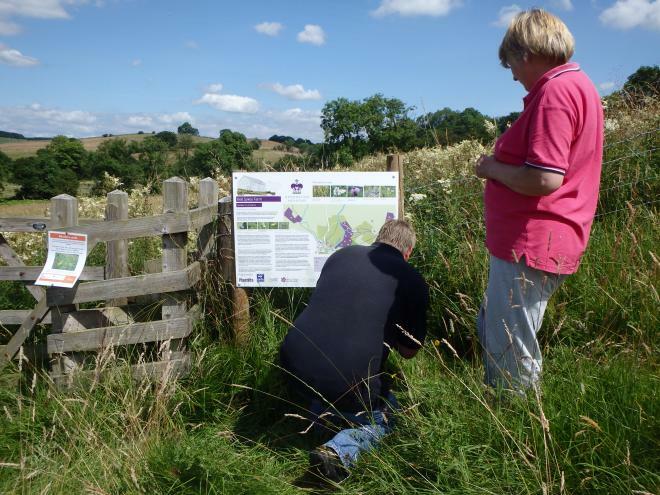 Work on the downloadable self-guided walks has continued, with visits to the sites involved with the local Access Officer in order to set out exactly what improved furniture is required to make the chosen meadows accessible to as many people as possible. The fantastic news on this is that one of the farmers involved in the project as a donor of organic hay has agreed to work with us to develop a Tramper route passing through three of his meadows. We hope this will be ready to open in June 2013. In addition to the Haytime events being run through Festival Bowland, we have organised a winter scythe maintenance workshop at Bentham Mart on the evening of Wednesday 6 February, during the fat lamb sale, when scything expert Tom Brandon will be demonstrating scythe maintenance, peening and sharpening, and members of the team will be available to talk with interested farmers, copy hay time photographs and collect hay time stories. We are hopeful that this will encourage more farmers to get involved with the project. Progress has been good in Bowland, despite the rain. 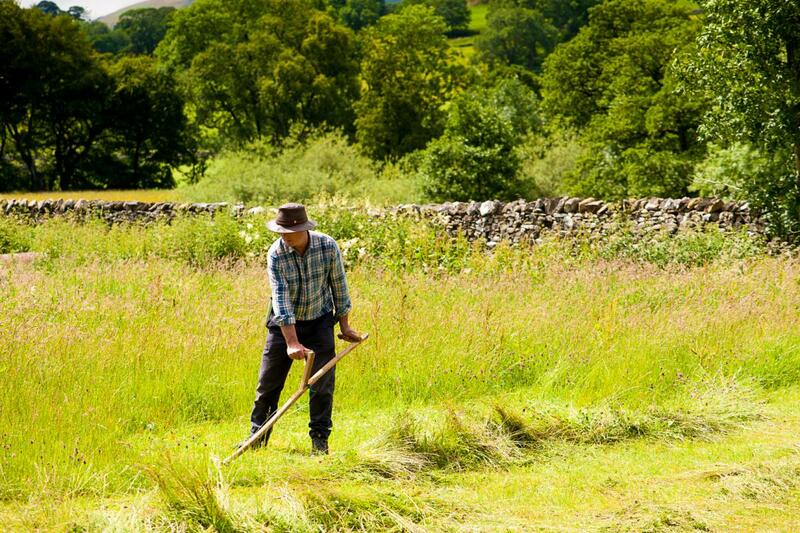 On the 28th July we organised a Scything Taster day at Stephen Park in Gisburn Forest, where Ian Hunter and Tom Branton taught 20 people scything skills including cutting hay and sharpening scythes; everyone had a good time, and the feedback we had was really positive. We are planning to follow this event with a winter scything clinic, where Tom will be on hand to get scythes back into working order, and the project also hopes to collect their Hay Time stories. On the 11th August we organised a seed collecting event, where we were joined by 16 volunteers and collected seed from Bell Sykes SSSI and its surrounding road verges. We were very lucky to have the skills of Peter Foley on hand to instruct and demonstrate how to dry, clean, sow and propagate the different species we collected. 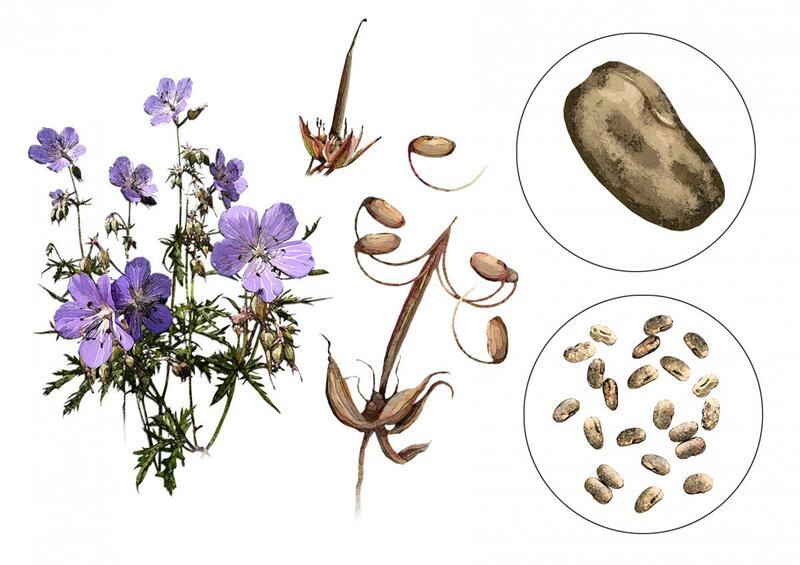 We will be meeting again to collect seed from the later flowering species, at the request of the volunteers. Following this, 4 volunteers from Comply-Direct travelled over to Bowland to help collect seed for the project, and spent the morning collecting yellow rattle, knapweed and meadowsweet for use on the meadows we are enhancing. After all the planning of the previous weeks, the transportation of green hay from the donors to the restoration sites began on 12th August. 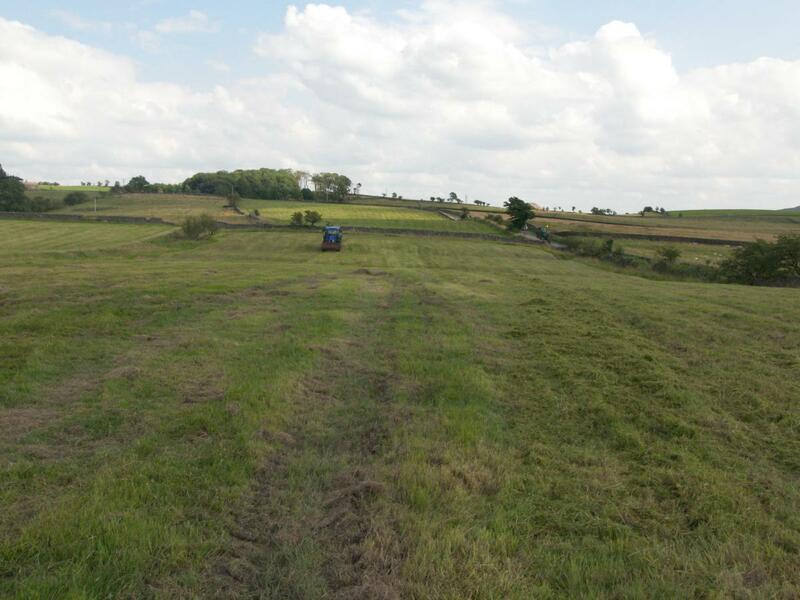 The weather held until Wednesday night, and during that time hay was spread onto six restoration meadows totalling 12.7 ha and hand collected seed was spread onto a further three meadows (4 ha) to enhance their species diversity. There were two more sites waiting for another break in the weather, which unfortunately didn't come, and so they will be added to next year's 'to-do' list. On the 19th August, Hay Time project officer Sarah Robinson travelled to the Gyimes Valley in Transylvania to take part in the 4th Annual International Hay Making Festival. Hosted by a local farmer and his family, the festival is organised by the Pogany-havas micro-regional association and aims to show visitors the traditions and customs which support the upland hay meadows of the area. 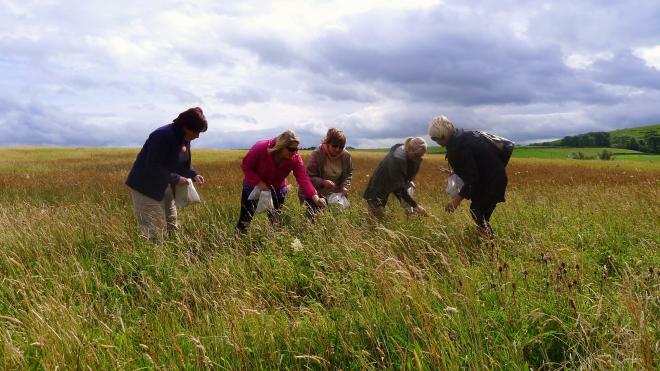 The study tour was part of Yorkshire Dales Millennium Trust Sowing the Seeds Project and was funded by LEADER programme. Beewalk Report 2018 is now available to download here. See link at the bottom for the Haytime in Bowland DVD produced in 2017 by Pendle Life-Time. Starting with scenes from the 2017 Haytime Festival at Bell Sykes Farm, Slaidburn, the film introduces the viewer to the Bowland Haytime Project explaining why there is need to regenerate our meadows, and briefly shows how it can be done. (Produced by Peter and Daphne Copestake 2017). For further information about the project contact Sarah - email sarah.robinson@lancashire.gov.uk or Carol - email carol.edmondson@lancashire.gov.uk or Telephone on 01200 448000.